and we are no longer selling parts. If the stove gets over 300 Deg this switch will stop the supply of pellets even if the manual button is pressed. The combustion blower and convection blower will stay running to burn up the rest of the pellets and to cool the stove down . This switch will close at 110 deg. allowing power to come from the Terminal strip to the combustion blower after the 15 minute start up cycle. This is how the stoves knows to shut off after the stoves cools down after the pellet supply is stopped. Be for conducting this test be sure the stove is not truly overheated. 1. With the stove turned on press the auger button. If the green light on the control board comes on, the high limit disk is NOT the problem. Set it to measure Ohms Resistance. Touch one probe to the terminal on one side of the thermodisk and the other probe to the other terminal of the thermodisk. If so then the thermo disk is NOT the problem. Check the power supply and connections at the terminal strip. It may be the control board, but check all other components first. Click here to order a control board. If you have high resistance (the number 1 on some meters or no beep) the disk is bad. order one here. You can bypass by connecting the white and grey wires together temporarily. Auger Thermodisk Test: See limit switches for descriptions of switches. The auger thermodisk (60-T-22) completes the electrical connection from the control board to the auger motor. This disk is normally open (N.O.) No continuity through it until it reaches a temperature of 110 Deg then it will close. The control board feeds power directly to the auger during the 15 minutes start up cycle through the ORANGE wire, after 15 min. power is fed through the YELLOW wire. If the stove is cold or it did not start up the first try it will stop feeding pellets. This prevents you from having a burn chamber full of pellets if your stove does not light or power goes off. Pellets feed after the stove is COLD? Problem: limit switch is stuck Closed. 1. Unplug stove! STOVE MUST BE COLD! 3.Check the switch for continuity with a meter. a. Set it to measure Ohms Resistance. b. Disconnect the Yellow wire from disk. c. Touch one probe to the terminal on one side of the thermodisk and the other probe to the other terminal of the thermodisk. If so then the thermo disk is NOT the problem. If you have zero or very low resistance. (or beep on some meters) the disk is bad or stuck closed. order one here. 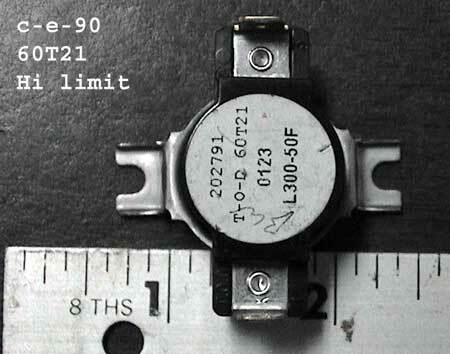 Problem: limit switch is not closing after it reaches 110 deg. 1. Start the stove and let run for a min of 15 minutes on the D or high setting. If you may need to keep the fire going by pressing the manual feed every few moments. 2. Bypass the auger thermodisk by using an insulated jumper wire to connect the orange and yellow wires that normally are attached to the switch together. wait a 15 seconds. The auger should now feed pellets every few seconds. 3. If the auger DID come on then the auger thermodisk is bad. order one here. 4. If the auger did not come on when the thermodisk was bypassed, check to make sure power is going to the switch from the control board. If no power from the control board be sure the Vacuum circuit and high limit circuit are working, Usually the green light will be on if those two circuits are working. Remove the motor and connected it to 110 volts to see if it works. If it does then you have an auger jam or or motor is weak. Blower Thermodisk Test: click here for limit switch descriptions. If your Combustion blower shuts off after the 15 minute start up cycle, most likely this switch is bad. The blower thermodisk (60-T-22) completes the electrical connection from the terminal strip to the combustions blower motor. This disk is normally open (N.O.) No continuity through it until it reaches a temperature of 110 Deg then it will close. The control board feeds power directly to the blower during the 15 minutes start up cycle through the BLUE wire (most stoves some may be different), after 15 minute start up cycle power is fed through the purple wire directly from the hot terminal strip. If the stove is cold (limit switch did not reach 110 deg.) or it did not start up the first try, the blower will shut off and the stove will stop feeding pellets from the lack of Vacuum due to the blower not running. (may be blue) leading to the combustion blower that normally are attached to the switch together. The Combustion blower should now run. 3. If the blower DID come on then the blower thermodisk is bad. order one here. 4. If the Blower did not come one when the thermodisk was bypassed, check to make sure power is going to the purple wire from the power terminal strip. 5 If you have 110V going to the blower and it is not running it may be bad and overheating. Click here to order.